The Warrior range of high lift pallet trucks has been designed, developed and built to give outstanding long service with minimum maintenance required and assist with all manner of lifting, manoeuvring, pallet handling etc. within industry and commerce. A sound long term investment! Our manual high lift pallet truck has a maximum load capacity of up to 1000 kg and a lift height of 800 mm (with the minimum lowered height at 85 mm). Designed for use with open bottomed pallets (e.g. 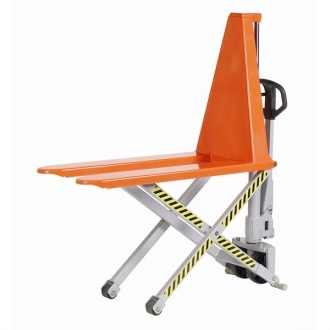 : europallets or stillages), the manual high lifter is available in 2 sizes and offers a quicklift pump action for loads below 250 kg, plus adjustable stabilisers. For heavy duty applications, we recommend the single hydraulic ram high lifter which has less working parts.